The politicization of the Kurdish military and security forces has a diverse and severe impact on human security, and stability in the Kurdistan Region of Iraq. 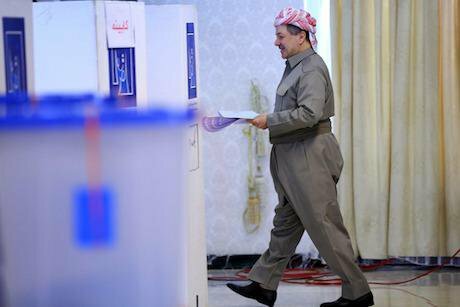 Kurdish regional President Massoud Barzani prepares to casts his vote inside a polling station for parliamentary elections in Irbil, Iraq, Wednesday, April 30, 2014. Picture by STR AP/Press Association Images. All rights reserved. The lack of a nationalized armed force in Kurdistan remains the biggest threat to its future. The Iraqi constitution allows the Kurdistan Regional Government to form its local force and legalize the existence of the Peshmerga, but Baghdad does not intervene in the details of the formations and the recruitment process. The ruling parties in Kurdistan have the ultimate power over mobilization, recruitment, and financing of the security forces. Kurdistan has been an autonomous region since 1992. It emerged as a quasi-state after the establishment of the no-fly zone in northern Iraq by the United States – along with the United Kingdom and France - which put an end to Saddam Hussein’s murderous attacks on the Kurds. From this time onwards, The Kurdistan Regional Government (KRG) has been predominantly ruled by two major parties; the Kurdistan Democratic Party (KDP) and the Patriotic Union of Kurdistan (PUK). Mustafa Barzani, established the former in 1946 while Jalal Talabani had founded PUK in 1975 when he split from Barzani’s KDP. Although the two parties have fought the Iraqi regime in the 1980s, they also fought one another. The Kurdish armed forces known as the Peshmerga and the security forces known as Asayish have been politicized by both the KDP and the PUK for political and economic gains. This is not new, since the rise of the KRG, the Kurdish military and security forces have been divided between the two ruling parties, and the elites within the two sides also have their private forces. For example, Kosrat Rasul, PUK’s deputy secretary general, has his protection unit called Hezekani Kosrat Rasul, while Talabani’s son, Bafel Talabani, commands the counter-terrorism unit, which is not controlled by any ministry. The same applies to the KDP:Nechirvan Barzani, prime minister of the KRG, has his battalion. Although there have been many efforts to depoliticize these forces since the creation of the KRG, they remain politicized and pledge allegiance to the ruling elites. The lack of an institutionalized force led to the breakdown of the internal unity of the Kurdistan region’s territory and decision-making abilities. As a result of the Kurdish civil war (1994-1998) two de facto administrations exist within Kurdistan: the ‘green zone’ (Sulaimani province) controlled by the PUK, and the ‘yellow zone’ (Erbil and Duhok provinces) controlled by the KDP. The KDP exercises a limited power over the forces in the PUK zone, the same is true for the PUK with regard to the divisions in the KDP areas. The security cooperation between both groups is shaped by politics and personal interests and is defined by distrust. Lahur Talabani, the head of PUK’s Zanyari Agency (PUK’s intelligence unit) revealed these divisions at the Washington Institute For Near East Policy, publicly saying that both KDP and PUK intelligence agencies never meet, and accusing the KDP of carrying out the Hawija raids without his knowledge, even though officially both the KDP’s Parastin agency (intelligence agency) and PUK intelligence agency (Zanyari agency) combined under the umbrella of the Kurdistan Security Council, which is established in 2011 by parliament. Talabani said: “we as a Zanyari agency, have a good relation with more than 30 countries, exchanging information with their intelligence services, but we do not cooperate and share information with the KDP’s Parastin agency.” Moreover, in an interview with Newsweek, Talabani said: “at times, we have had a better working relationship with Baghdad than we have with our counterparts in Erbil.” This was evident in 2014 when ISIL besieged the northern Syrian town of Kobane. Distrust reached a point where the two sides accused each other of conspiracy. For example, when in October 2016 ISIL fighters attacked the Iraqi city of Kirkuk, the PUK indirectly accused KDP forces of facilitating the entry of ISIL fighters to the city. The division among Peshmerga forces hinders their ability to fight ISIL. According to Michael Knights, Senior Fellow at the Washington Institute for Near East Policy, the distrust resulted in unequal distribution of equipment between Peshmerga divisions: “First of all you have some very well equipped units, the Praetorian party elite units, and you have some very under-equipped units. There’s probably not the optimal distribution of equipment across the units.” He explained that this is particularly troublesome when facing a highly mobile enemy like ISIL, which can choose to exploit weak points across the long front line. Nevertheless, the politicization of the security forces is a major obstacle for strengthening democracy in the Kurdistan Region of Iraq. In October 2015, the security forces loyal to the KDP prevented the Kurdistan Parliament Speaker, Yusuf Muhammad from the Change Movement (Gorran), the second-largest bloc in parliament, from entering Erbil. Muhammad was trying to do his job as the speaker to amend the presidential law, which was due in August 2015. The Kurdistan presidential law does not allow anyone to remain in power for more than two terms. Massoud Barzani, the leader of the KDP, has ruled the region for two terms and his latest term was extended for two more years, but the law does not allow Barzani to run again. the Kurdistan parliament tried to amend the law so that the Kurdistan president would be elected by parliament but the KDP opposed this action and closed the parliament. Since then, the Kurdistan Parliament remains dysfunctional. Following this incident, Gorran ministers were unilaterally expelled from the government by the KDP, who proceeded to fill all ministerial posts. Furthermore, during Iraqi Kurdistan’s2013 provincial elections, Gorran’s Haval Abubakar won the vote for governor by 241 thousand votes, yet he was denied the post by PUK and was instead made head of the provincial council. These are some clear indications that those who have control over security forces undermine democracy and use their forces in order to remain in power. Without a doubt, the same groups, who take credit for keeping the Kurdistan Region safe, may destabilize the region if they are defeated in the ballots. This division of the military and security forces keeps the threat of civil war present. It is clear that there is no national agenda, rather what does exist are the different agendas of the two ruling parties. When these two collide, civil war is always possible as was the case in the 1990s. In other words, these political parties do not believe in the democratic process or in solving problems through peaceful dialogue. This is the reason people like Denise Natali argue that Iraqi Kurdistan is heading towards a civil war. Finally, KRG’s politicized security forces endangers human security within Kurdistan. Since the justice system is not independent enough, these security apparatuses ignore their decisions. Meanwhile, journalists are killed, religious scholars are fired, while poverty and unemployment are at their highest levels. Consequently, tens of thousands people migrate from the area, as the ruling parties get richer and the government goes bankrupt and the people of Kurdistan feel less and less safe.